It’s official. Today is the last day of summer 2016. With some nice ripe peaches still remaining I thought it would be fun to savor among the final treasures of the season and prepare an Old Fashioned Peach Dumpling. I call it ‘Old Fashioned’ for it is adapted from a 1928 cookbook titled “Anyone Can Bake” compiled by the Educational Department of the Royal Baking Company. The Old Fashioned Peach Dumpling reminds me too of times past when more leisurely daily meals with families were commonly followed by a homemade dessert, not always fancy, often simple, but a dessert that oftentimes included some sort of preparation using fruits of the season. On the other hand, not to be too idyllic on food histories for at the time this cookbook was printed in 1928, its introduction pages included more formal daily disciplines including a section on “Table Appointments and Table Service” sharing the importance of a “charming table” thus going on to say “And what woman does not take pleasure in pretty linen, spotlessly clean; shining silver, glass and china?’ it should also be noted that in precisely the following year, 1929 brought with it the Great Depression. Times changed and this puts things in perspective. The recipe for the dough, similar to dough variations of master recipes that continue through time, is not too sweet in its combination of flour, baking powder (of course, Royal Baking Powder) salt, shortening, and milk. 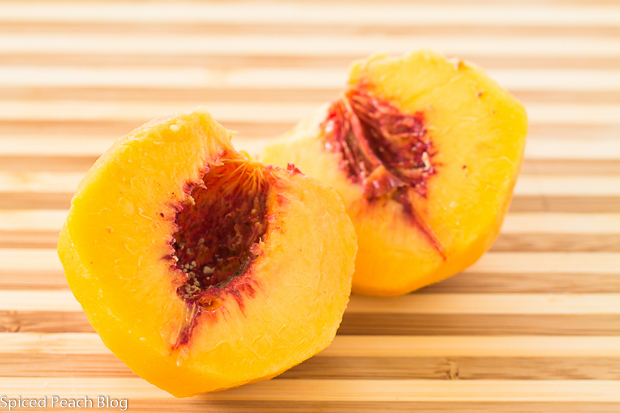 And it matches well with the ripe juicy peaches, those remaining last of the season for savoring. I’m finding the seasons end a little bittersweet, perhaps you are too. 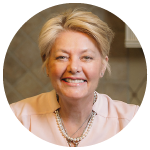 For between many grand moments with family and friends, beaches, barbecues, parties, and fun trips, still, I feel as if there was so much more I wanted to enjoy and prepare. As I stand by the big stainless steel pot on my stove lidded over boiling water, assorted clear jars packed with varying fruits or vegetables, I wait. The timer lets me know the process is now over, storing each part of a memory to a counter the lids begin pinging like tiny little bells. I admire each creation, the storage of flavor memories for cooler days ahead. I ponder if I should pull out the yoga pants for walking to the bus stop tomorrow. Nah. I’ll wear shorts. Sift together the flour, baking powder, and salt, then add to the bowl of a food processor. Plop in the shortening and pulse a half a dozen times or so until the mixture resembles a sort of meal. Pour in the milk pulsing about a dozen times until the dough is softened though still not forming a ball. Remove dough, wrap in plastic wrap and refrigerate for 30 minutes. 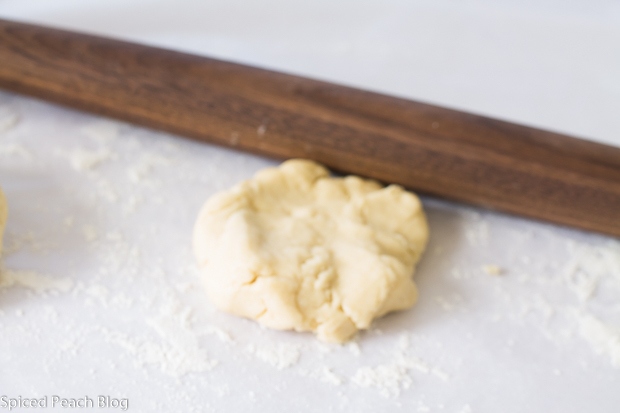 Divide dough into 4 parts and roll out on a lightly floured board. Preheat oven to 350 degrees. In a small bowl stir together the butter, brown sugar, and cinnamon. Spoon the mixture evenly into the cavity of each peach. One at a time place a whole stuffed peach onto the center of the dough, fold up to cover the peach all around. 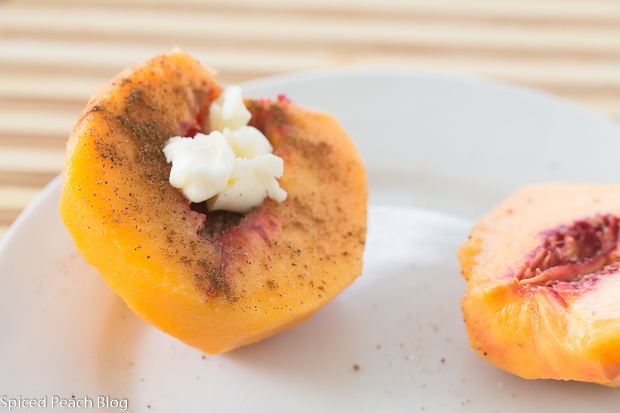 Brush peaches with egg wash then gently roll onto sugar, place onto a baking dish lined with parchment paper. Bake until golden brown all around, around 35-45 minutes. Serve hot with a scoop of ice cream or whipped cream. Adapted from "Anyone Can Bake" Compiled by the Educational Department of the Royal Baking Powder Co. 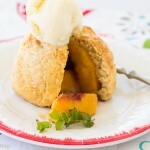 This entry was posted in Sweet Treats and tagged Old Fashioned Peach Dumpling, Peach Dumpling, Peaches. Bookmark the permalink. Post a comment or leave a trackback: Trackback URL. Hi Peggy, can’t believe it is the last day of summer. Time just flies doesn’t it? Anyway I love old cookbooks looks like you have a winner. 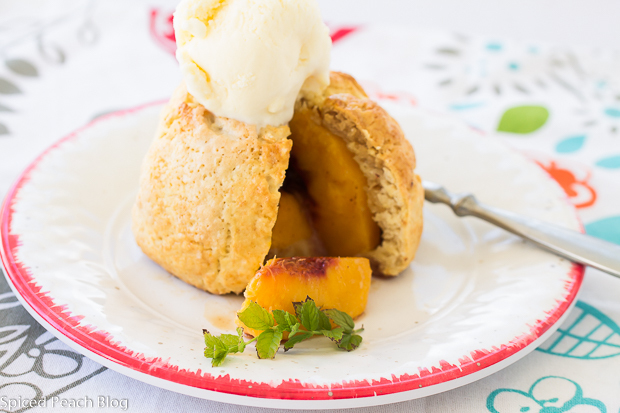 Delicious looking peach dessert, the perfect way to end summer. Hi Cheri, I know, I can’t believe it is the last day of summer either. Time really does fly and I know you were able to fully maximize so much bounty from your garden over the summer, most enjoyable to read, and I’m sure in your case, to savor. 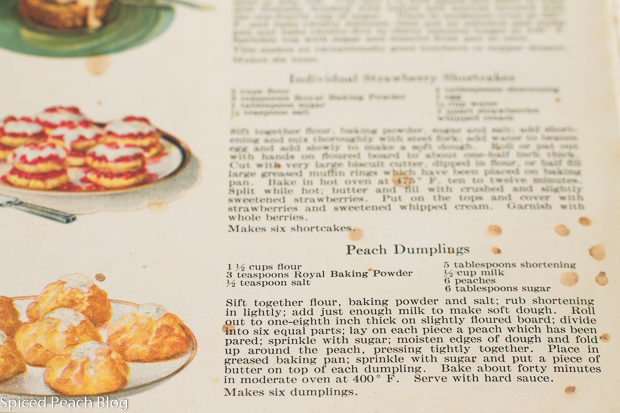 I love old cookbooks as these as well and do enjoy trying out the dishes of the time as well, agreed, the peach dumpling was the perfect way to end the summer! Hi Peg, love it. The dough and the peach really does look sort of old fashioned and with that nice ball of vanilla ice cream on top. Delicious. Hi Joanne! Thanks so much, appreciated, they really were delicious and perfect for the end of summer! Looks delicious Peg. I like the old fashioned look with the ball of ice cream on top. See you soon. 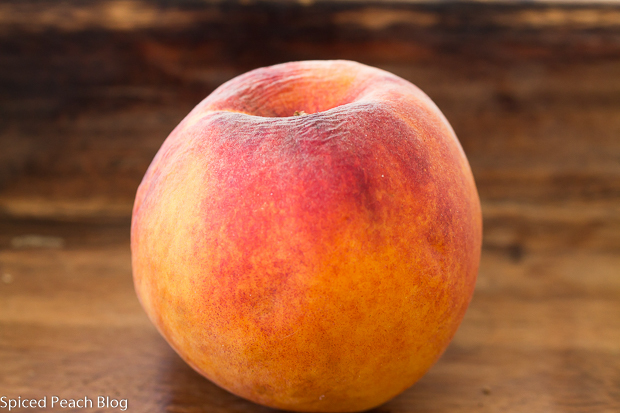 We lost our local peach crop due to drought, but we have had some tasty imports. I’m drawn to the look of this dessert. It’s just so pretty. It reminds me of individualized cobblers. What a perfect end to summer, Peggy! Hi Kelly, thanks so much, the peach dumpling is pretty, and indeed a perfect end to summer. Have a great weekend!